Kleefeld on Comics: On History: Where to Draw the Line? Starting in my teens, and running up into my mid-30s, I was big fan of the Fantastic Four. I was originally enthralled by John Byrne's take on the characters, and my interest led me backward through the 250-some issues that had come before. I wanted to see where these characters came from and how they got to be who they were in the books I was reading. That branched out towards some other Marvel characters (typically via the FF -- like all the guest stars that appeared in Marvel Two-in-One) and I would work backwards through those characters' histories as well. But the thing I eventually discovered was: that goes on indefinitely. See, once you get back to Fantastic Four #1, you might think you've got nowhere to go. 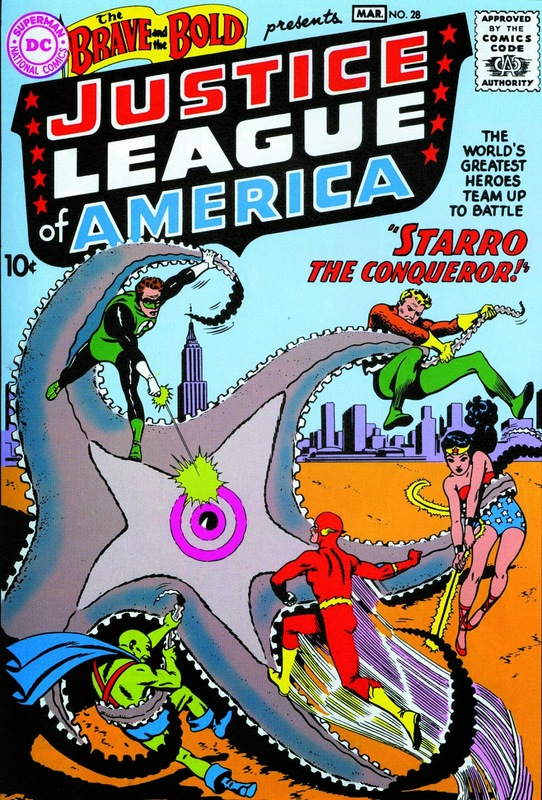 But that book was almost a direct reaction to the Justice League of America. 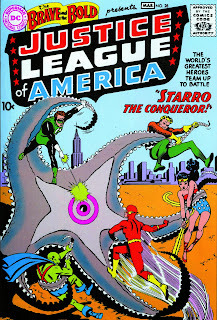 (The cover to FF #1 even has more than a passing similarity to the Justice League's cover debut on Brave and the Bold #28.) And, of course, the FF also have some similarities to Challengers of the Unknown which isn't surprising given that creator Jack Kirby worked on both. Oh, and didn't the Flash debut in Showcase just a couple issues before Challengers? He was also in the JLA. But, hey, wasn't there a Flash before Barry Allen? And what about the Justice Society? And they were co-created by Gardner Fox, who was influenced by The Gods of Mars and The Warlord of Mars by Edgar Rice Burroughs. Who also created Tarzan. Which harkens back to Rudyard Kipling's The Jungle Book. This can go on indefinitely. I even haven't touched on Kirby's personal influences like Milt Caniff, Hal Foster and Alex Raymond. Or his work at Fleischer Studios or the Eisner & Iger Studio. And even then, we're still only talking about the 20th century. So if you're looking to find where the Fantastic Four really came from, where do you draw the line? How far back is it worth going? Or does it matter? In my particular case, I found some of the influencers so interesting that they were worth pursuing on their own! I stopped looking at material that might have helped lead to the Fantastic Four a few years back now because I got sidetracked on other aspects of comics history. Ones that have mysteries that are equally or even more compelling. But... how far back do I go with those?